January 30, 2011 – The only night I ever spent in prison scared me, just not exactly straight. You see, it wasn’t the kind of scared where you change your life for fear of suffering bad consequences. It was the kind where you scream and run and flail your arms around like Kermit the Frog on the hand of a puppeteer with Parkinson’s. This was a few years back, sometime in early 2006, if all the meta-information in that pic of me in the prison cell is correct. I can’t trust my own memory in the matter because every previous year in my mind is 1989. 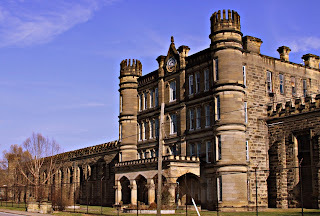 The prison where I served my micro-term was West Virginia State Penitentiary in Moundsville, West Virginia, also known as Moundsville Penitentiary. 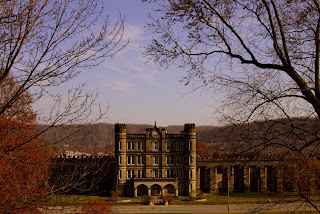 Moundsville was built in the 1870s, only about a decade after West Virginia itself became a state. 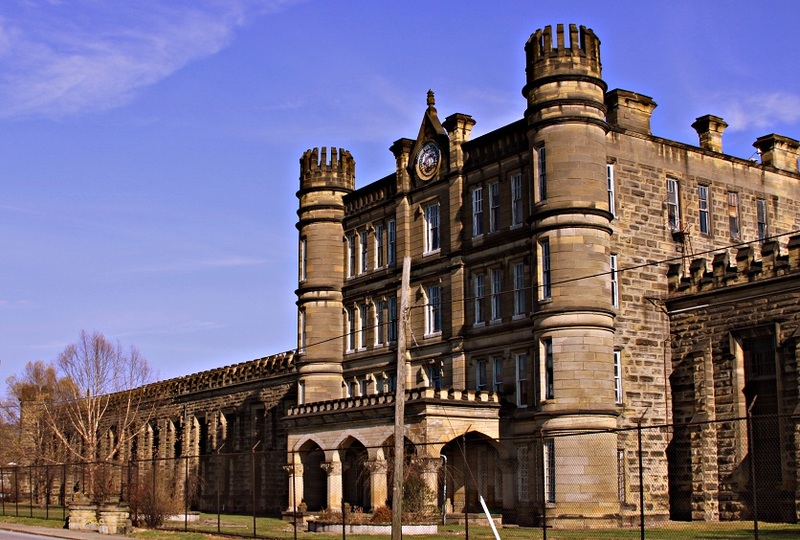 Back then, the prevailing notions on behavioral modification and punishment involved giant castle-like edifices with thick razor-wire-topped walls. In these more enlightened times, we know that fluorescent light, drop-tile ceilings, and cubicles are much better both for punishment and for crushing any kind of extreme passion out of a man, regardless of which end of the good-evil spectrum it lies. 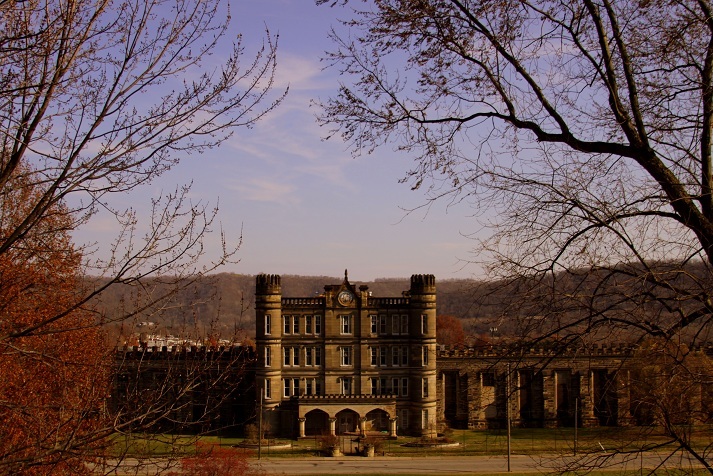 Moundsville eventually closed in 1995 when it was ruled that its tiny cells—tiny cells that at one point in the history of the prison held three people per—were deemed the proverbial cruel and unusual punishment, a phrase that for some reason we never acronym’d as CUP. From now on, though. 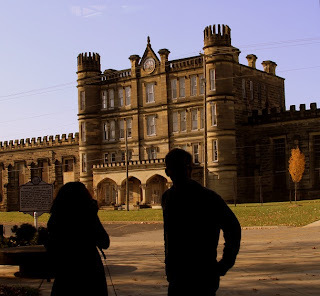 Like other of its contemporaries such as Eastern State Penitentiary in Philadelphia and Alcatraz in San Francisco, once Moundsville stopped detaining people within its walls against their will, tons of people wanted in of their own volition. So it became a tourist attraction. 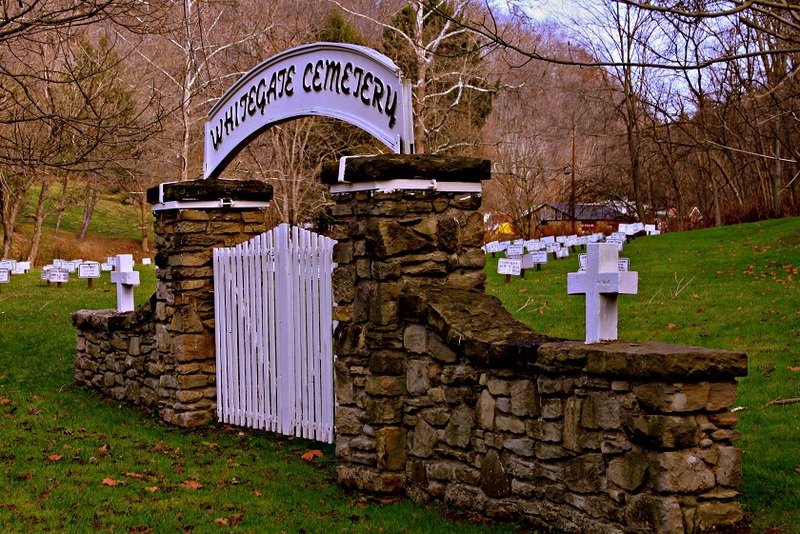 However, Moundsville took it all one step further. I mean, sure, you could tour it during the day, and, sure, they threw a mean haunted house every Halloween, but you could also spend an entire night there, exploring the place more or less unchaperoned. Of course, since this is the 2000s that we’re talking about here, they didn’t then and don’t now call it exploring. They call it ghost hunting. 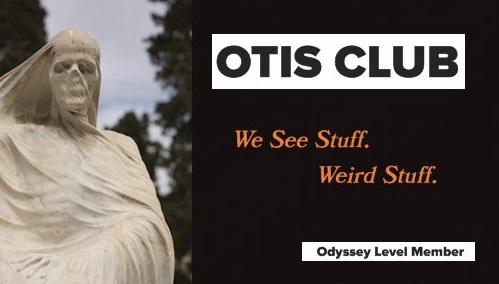 Now, I’m a man who adores ghosts both in his fictions and in his cereals, but who finds them unevidenced in real life. However, if you’re of the idea that tragedy makes the electronically detectable souls of mankind knock over chairs in the middle of the night, you might as well act on that belief in a place like Moundsville Penitentiary. After all, it’s got a pretty violent and macabre history, even for a prison. 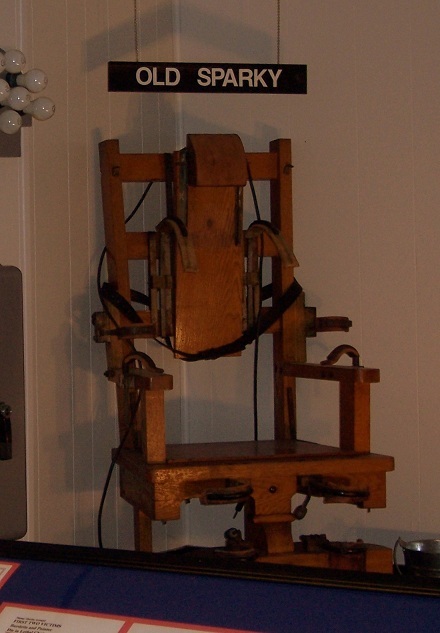 At its highest capacity it kept thousands of mankind’s worst out of civilized society, while inside it endured riots and inmate attacks, dozens of murders, and about 100 state-sanctioned executions. That’s a lot of heavy emotional baggage to have to lug into the afterlife. You might as well hang out on the earthly plane with it for a while and catch your non-breath first. I arrived at this massive foreboding building after dusk, so I don't have very many pictures of the night. All the daytime shots in this article were taken just a few months ago when we happened to be in that wood’s neck. The place hadn’t changed, hadn’t much to say, but, man, I still think that cat’s crazy. It’s basically in the middle of town, right across from the aforementioned archeology site and a residential neighborhood. 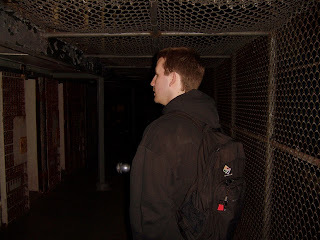 I can’t remember how many people were there for the ghost hunt. I think it was somewhere between 40 and 60. I entered, signed in, signed a waiver, and hung out in the vestibule awaiting direction. 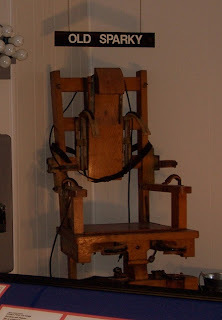 The vestibule area had a small museum that included a handwritten letter from Charlie Manson, who had wanted to be transferred to Moundsville so that he could be near family, and the prison’s actual electric chair, predictably dubbed “Old Sparky,” which had been built by one of the inmates. It sent nine men into the electric blue beyond before being decommissioned when the state outlawed capital punishment in 1965 over fears of creating Mitch Pileggi’s character in Shocker, which was pretty forward thinking considering that movie wouldn’t come out for another 24 years. Eventually, we were split into two groups for an official tour to kick off the night’s shenanigans, one of which was led by a paranormal investigator and the other by an ex-guard, who was a slight, affable man with grey hair and a matching moustache. I chose the latter’s group. The moustache only partially factored into the decision. We were also taken down into a dark utility room where an inmate had been ambushed and brutally murdered. I remember this room particularly because he made us all turn off our flashlights to show how absolutely dark the area was and how absolutely trusting he was that none of us strangers were going to murder each other in the moment. Of course, we saw prison cells. Like every other colossal prison there were floors and floors of them. He went so far as to lock us in the cells for a few minutes while giving us his best “I’m the guard and you’re the dregs of society” treatment. Other highlights of the tour included a sculpture diorama featuring life-sized statues of Native Americans that some inmate had created and, outside, a small chapel and the location where all the executions by hanging took place. After the tour, we were led back into the vestibule where we watched a documentary about the place and ate some pizza. Then, like Willy Wonka telling everyone to try his Chocolate Room, they told us we were free to move about the prison on our own. Other than that front area, there were no lights on in the prison all night, and if an area was off limits, it was locked. So pretty simple rules for dating that daughter. Now, threescore people running through a dark prison in the middle of the night both takes the edge off of it being scary and then adds a whole new edge of scary. 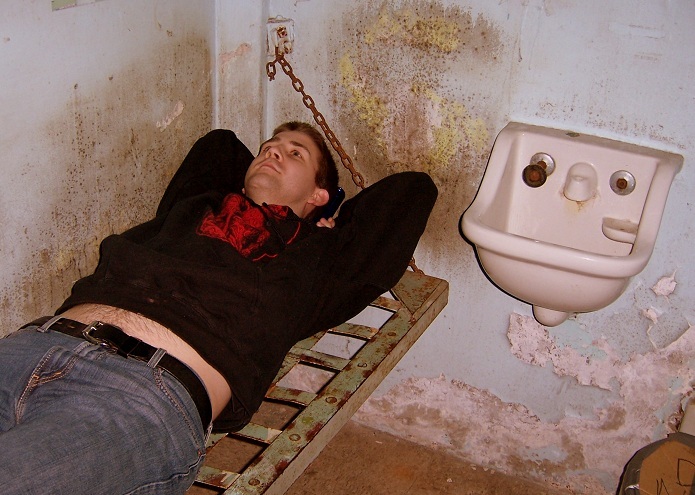 The screams of teenage girls reverberated floors away, and every once in a while somebody would run past you in utter terror at having spooked themselves in a cell or having disturbed a bat or something. In my experience, spooked is a contagious disease, and it’s most transmissible between the hours of midnight and 3 am, so every once in a while I did get infected. It was always short-lived, though, because you were pretty quickly reminded that you were being allowed to do this and that you were doing it with a flash mob’s worth of other people. Every once in a while I’d stumble on visitors who were actually there to hunt ghosts and not just run around screaming like kindergartners at recess. They’d be in the areas of the prison with the darkest history, gathered around a glowing screen or waving some bit of electronica. I do miss the days when spirit contact was all about Ouija boards and séances instead of infrared digital cameras and EMF detectors. Simpler times. Speaking of the dead, I’m going to break chronology here a bit. While we were there a few months ago, somebody pointed us toward a small 100-year-old graveyard a few miles away from the prison that had been established solely to bury unclaimed convicts. 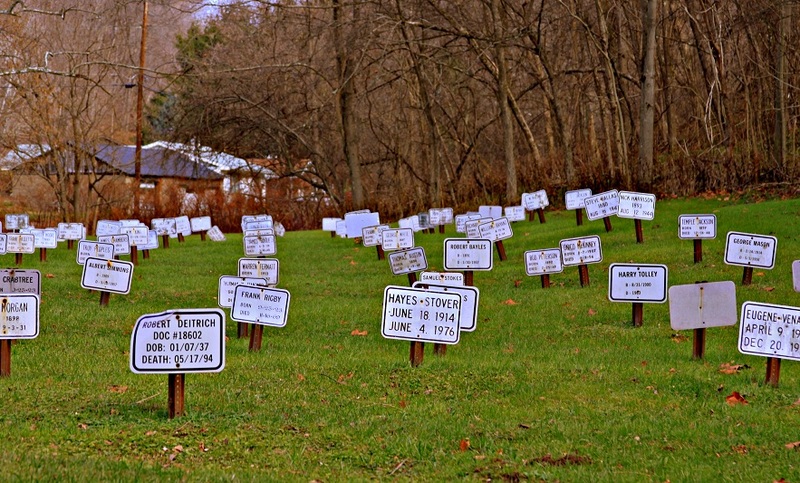 It’s located on Tom’s Run Road, and features rows and rows of white, metal, license-plate-like signs with the names, DOBs, and DODs of the detained-deceased. 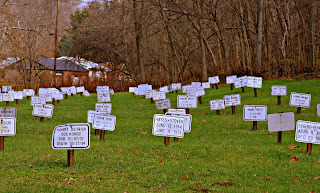 So after you see where they were life-sentenced, you can go see where they were death-sentenced. Back in the past, sometime around 3 am I found myself ready to go. Turns out, if you’re not hunting for ghosts, there’s only so many times you can read the graffiti on the cell walls or shine your flashlight into dark corners before getting, well, not bored, but definitely done. Plus, I still had a five-hour drive home, so I signed out and left, pondering what to do with my new-found freedom. 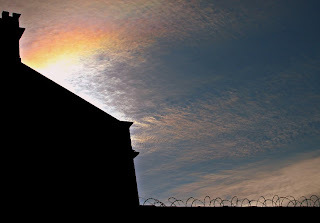 These days, by the look of its website, ghosts are the main trade of the prison, with multiple types of opportunities for staying overnight and bugging the spirits of the badly lived. From my experience, it’s a sleepless night well spent.